Meet & Greet on arrival at Kolkata Airport & transfer to Hotel. On arrival check into hotel. Overnight stay will be at Kolkata. After breakfast transfer to Kolkata Airport. Board a flight to Bhutan. On arrival at Paro Airport and transfer to Thimphu (7,710 ft.) the capital city of Bhutan. On arrival check in at the hotel. Evening explore the Thimpu town by walk. Overnight stay at Thimphu. After breakfast drive to Punakha / Wangdue, On the way Stop at Dochu-La-Pass (3150 mts.). to view the higher Himalayas. Arrival at Punakha check in at hotel. After noon visit Punakha Dzong - built in 1637 by Zhabdrung Ngawang Namgyal. For many years until the time of the second king, it served as the seat of the Government. The Dzong was named Druk Pungthang Dechen Phodrang (Palace of Great Happiness). Punakha is still the winter residence of Je-Khenpo and King Jigme Dorji Wangchuck convened the first National Assembly here in 1952. After that take a short excursion trip to visit the Chhimi Lhakhang - The Temple, also known as “The Temple of Fertility” was built by Lama Drukpa Kuenley, “The Devine Mad Man”. Evening free for leisure. Overnight stay will be at Punakha / Wangdue. After breakfast visit Drukgyel Dzong. 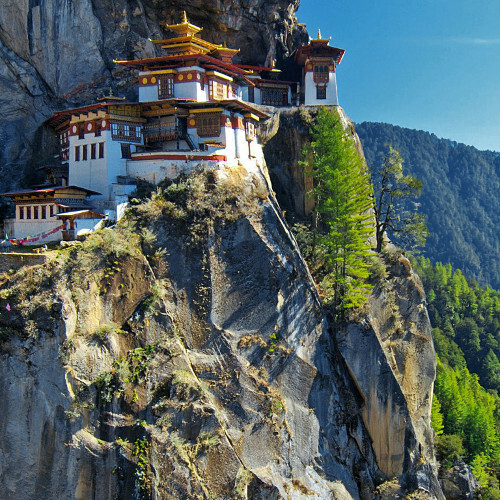 Also visit famous Taktsang Monastery - called “Tiger's Nest” (2hrs hike from the base camp) & Kitchu Monastery. Overnight stay will be at Paro. Permit for Bhutan: Indian nationals do not require any visa for Bhutan. A permit will be issued at the entry point on production of a passport or Voter ID (only valid document for issuing the Bhutan Entry permit) and 04 passport size photographs. For permit guest should carry valid voter ID along with 2 photocopies & 2 photographs. If guest doesn't have voter ID they have to carry Passport along with 2 photocopies & 2 photographs. Cost incidental to any change in the itinerary / stay on account of flight cancellation due to bad weather, landslides, ill health, and roadblocks and / or any factors beyond control, political disturbances (strikes), etc (to be borne by the client, which is directly payable on the spot). Documents: For permit guest should carry valid voter ID along with 2 photocopies & 2 photographs. If guest doesn't have voter ID they have to carry Passport along with 2 photocopies & 2 photographs. 25% refund for cancellation between 8-15 days prior to the tour date. 50% refund for cancellation between 16-20 days prior to tour date. 75% refund for cancellation 25 days prior to tour date.